So Sarah and I couldn’t help ourselves. We had to try and top our Caribbean cruise from hell in 2008 with something even bigger and better in 2009. And what could be bigger than Alaska? Or harder to get to…. It seemed to me after spending 24 hours on airplanes or waiting in airports, I should have at least been as far away as Norway. But no, it really did take an entire day to fly from Washington, D.C. to the capital city of Alaska, which by the way is accessible in only three ways–by boat, air, or birth. There are no roads into Juneau. In fact, the small city is nothing more than a precarious spit of land backed up against vertical mountains and clinging to the edge of the sea. Be careful of the advice of people who live in Seattle. 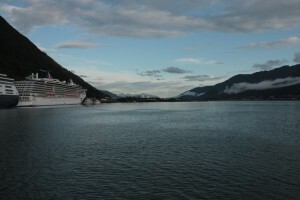 Juneau’s Goldbelt Hotel does a booming business serving the guests of the small cruise lines that ply the Inside Passage. Unfortunately, the lodging makes no attempt to actually earn any repeat business. Our room was comparable to what one might find in a Motel 6 with beds resembling upside-down sagging cardboard boxes. It probably wouldn’t have bothered us so much had we not paid $180 for the privilege of sleeping there. Nevermind. We were exhausted. Morning would shine a new light on everything. “Debbie, there’s a smashed up toilet outside our window,” she called. Something made me want to cover my head with a pillow and go back to sleep, if only the bed would cooperate with my desire for comfort. It was happening again…I could feel it. This was going to be another vacation from hell. Even for me who had been dreaming of Alaska all my life. Well, there was plenty of incentive to get out of bed this morning. Things would have to be better once we checked out. If the bear pants fit, wear 'em! Of course, checking out before the rest of the town was barely awake in our great rush to escape the Juneau equivalent of a Motel 6 led us into relatively deserted streets on a typically cool and wet southeast Alaska day. Fortunately, I was not expecting great things of Juneau, not in the sense of discovering high civilization on the edge of wilderness that is. I wanted my Alaska rough and wild, and Juneau satisfies in many ways. And that’s as it should be. 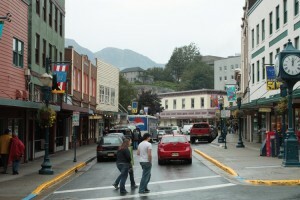 Juneau sprang to life overnight with the Klondike Gold Rush, and it still has that look of a haphazard thrown-up-in-a-rush frontier town. With most of the stores closed, we set about looking for breakfast and found one good enough to allay all our misgivings of the previous night and early morning. The Capital Cafe on Franklin Street, directly adjacent to the Baranof Hotel, a decidedly nicer option our acquaintances in Seattle had failed to mention when proffering advice on southeast Alaska lodgings, gave us our first taste of southeast Alaska fare. For Sarah, it was a salmon and asparagus omelet, for me, slightly spicy gravy over biscuits with some strangely neon yellow eggs. After breakfast, with a full day to kill before boarding the yacht that would take us on our first tour of the Inside Passage, we headed down into what at first seemed a pleasantly deserted town. But then, out of nowhere, three mega cruise ships came plowing into port, unloading an incredible array of blue-haired passengers who, it seemed to me, were ill-equipped to brave the Alaska wilds. 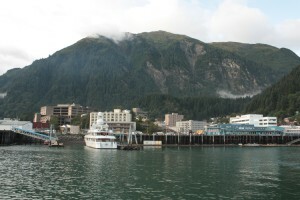 But they were brave enough to descend on Juneau’s rather prosperous waterfront with its shops selling everything from Russian imports to sealskin hats. 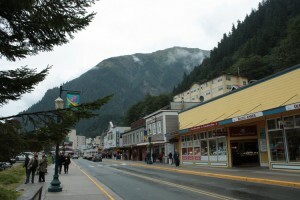 And as we plied the stores in search of some souvenir that wouldn’t make our carry-on luggage overweight and over-stuffed for our trip home the following week, we noticed something else curious about Juneau. There are more bars here than restaurants. And most of the bars don’t serve food…with the exception of the highly touristy Red Dog Saloon (the one place above all others you should avoid like the plague if ever you’re in Juneau). But perhaps, given the city’s persistently wet climate and minimal days of sunshine, bars are all the rage. Juneau does receive over 50 inches of rainfall annually, plus another 90 or so of snow. Most of southeast Alaska is, in fact, a temperate rain forest, and a day without rain (or at least mist) is an anomaly.